So this week I decided to give my skin a much needed treat! Each night I always use face wipes to remove my makeup, so wanted to do more of a full skin cleanse this week. And wow what a difference it’s made, my skin feels as soft as a babies bum, as the saying goes! The face wipes I normally use and have done for a long time are the Johnson’s Makeup Be Gone Moisturising Wipes. From the ones I’ve tried these are the only ones to not drag on my skin, or cause sensitivity around my eyes. 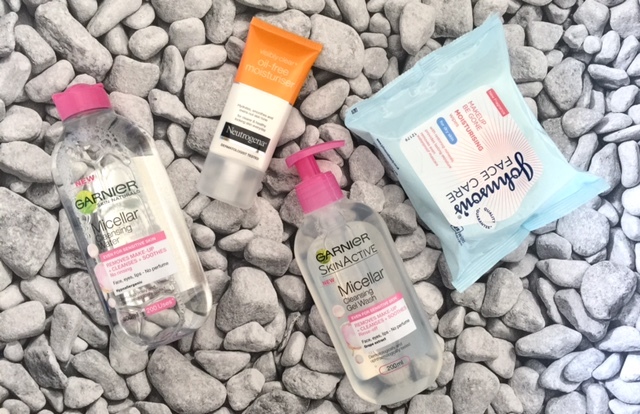 They do a few in the range including pampering, refreshing, clear skin, and extra sensitive; but my favourites are the moisturising ones as these seem to work the best for me when removing my makeup. I use these face wipes every night and my skin always feels clean and refreshed after, but sometimes I like to and think it’s important to do a more full on cleanse. Garnier Micellar Cleansing Water- I like to use this to remove my makeup, and to gently cleanse my skin. I normally use the large oval cotton pads, and find it takes about four of them to fully remove all of my makeup. I just stop when nothing comes off onto the cotton pad. I love this micellar water, it leaves my skin feeling fresh and like new. It’s also really affordable and comes in a handy travel size which is perfect for when your off on your travels. If you fancy taking a look you can find it here. 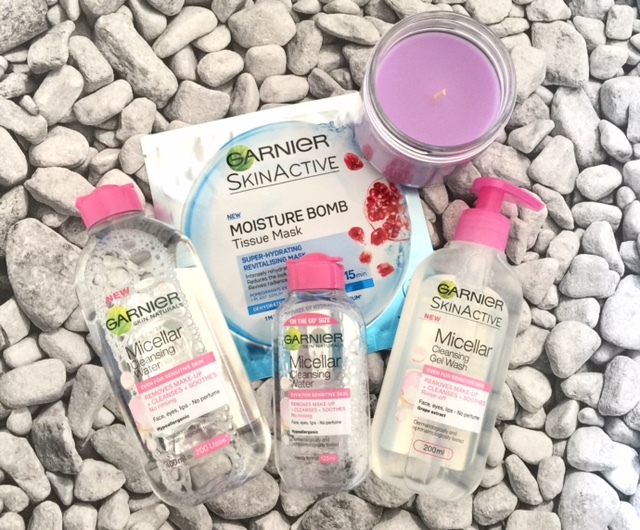 Garnier Moisture Bomb Tissue Mask- These are a new found favourite of mine and I can’t get enough of them. I’ve tried the pink chamomile and the blue pomegranate ones, and if I had to choose the best one out of the two I would say the pink chamomile one. These masks are super hydrating, make your skin feel smooth, and overall leave you feeling like you’ve just had a facial at a spa. I’ve seen they also have a green one out now which has green tea extract in, which I will definitely be getting when I see it in the shops. You can find the garner tissue masks here. Neutrogena Visibly Clear Oil Free Moisturiser- I’ve been using this moisturiser for quite a while now, but I’m not sure if its because I still have some to use up, or because I like it. I used to really like it and thats why I bought them on offer and got three tubes, but I’m near the end of them now and don’t think I will repurchase. Don’t get me wrong it’s a good moisturiser, I just want something a bit more luxurious and nourishing. If you’re a fan of Neutrogena products, you can find the moisturiser here. Garnier Micellar Cleansing Gel Wash- I used this for the first time this week, and so far I am impressed. I first used the micellar water, and then used this as a final wash afterwards. You first have to wet your face, apply this all over, then gently massage it into the skin. I love how it leaves my skin feeling refreshed and clean after. I will definitely continue to use this as I think its good to properly wash your face at the end of the day, especially when you wear makeup everyday like me. You can find it here. 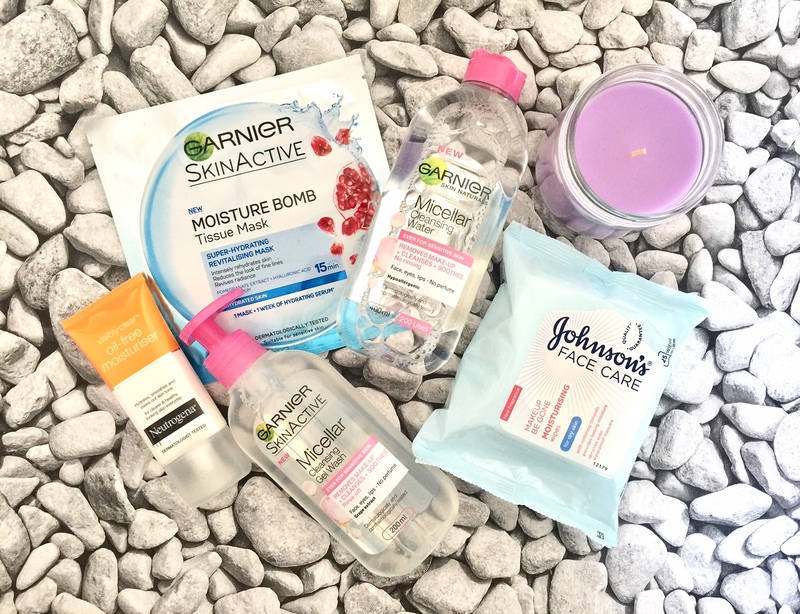 My skin is feeling well and truly spoilt this week, and I am going to make sure I do this more often, instead of just using face wipes. Yes it may take me longer in the evenings removing my makeup, but it will be better for my skin in the long run. What skincare products do you use? If there is a moisturiser you recommend please let me know in the comments section or by tweeting me over at twitter. Previous Post My Favourite Makeup Brushes! I love this post! I'm a massive fan of Garner skincare especially the Micellar water. I own so much stuff from garnier lol! I just love their skincare range ?